Beautiful brick home offering 3 bedrooms, 2.5 baths. Custom cabinetry, solid surface counter tops, huge island, gas stove. 36" microwave and pantry. Trey ceiling in LR w/corner gas log fireplace. Sun room w/tile floor. Large master with glamour bath and 2 walk in closets. 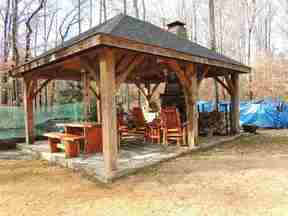 16X20 pavilion w/flagstone floor and stone fireplace. Large rock pond. Detached carport for RV parking. 9' ceilings through most of the home, solid wood doors. Security and sprinkler systems. 23X29 Double attached garage with 10' wide doors. Storm shelter does not convey with property.